The private sector Senior Housing development community is in an increasingly active state these days. The demographic fundamentals of the “Silver Tsunami” of aging Baby-Boomers instill confidence from investment communities motivating a variety of players to explore development projects. Increasingly I’m asked, “What are the profiles of these projects, and is there a “sweet spot” for the type and scale of project that developers are pursuing?” Having performed a number of feasibility studies for our clients, the answer depends on the developer’s program plans, typically informed by a market study. 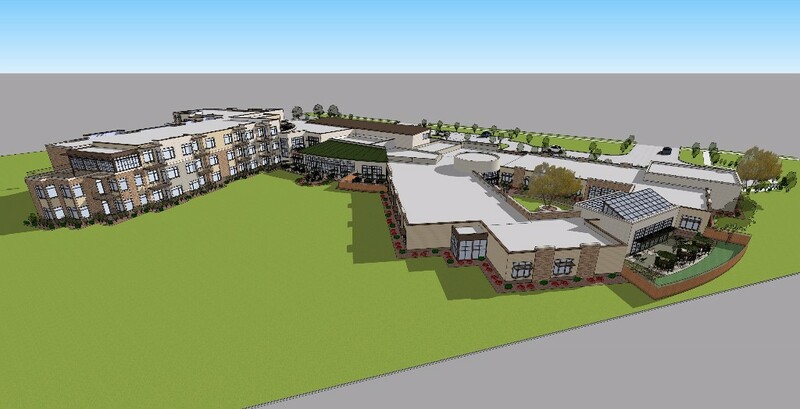 Setting aside large Continuing Care Retirement Communities (CCRCs) that offer a full continuum of care, we see the standalone facilities of the past giving way to new projects that include a mix of Independent Living (IL), Assisted Living (AL), and Memory Care (MC) residences. The largest differentiator we see among senior housing developers today is whether or not to include Independent Living residences in the project, or focus solely on a mix of Assisted Living and Memory Care units. 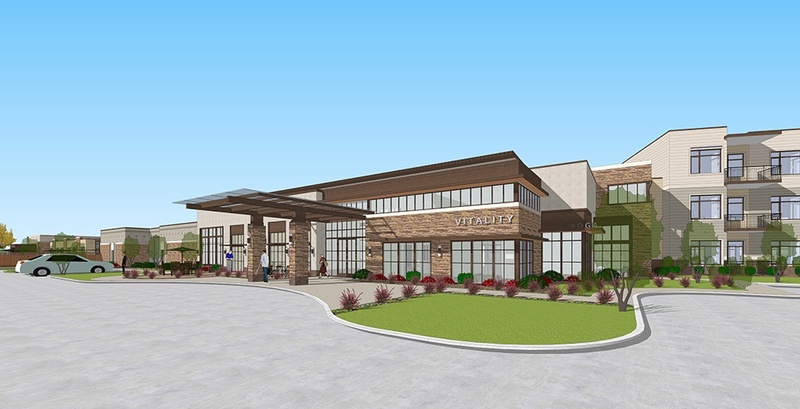 FitzGerald has designed an 89-residence senior living community developed by Sterling Hall and Vitality Senior Living, which was recently approved by the Village of Oswego. 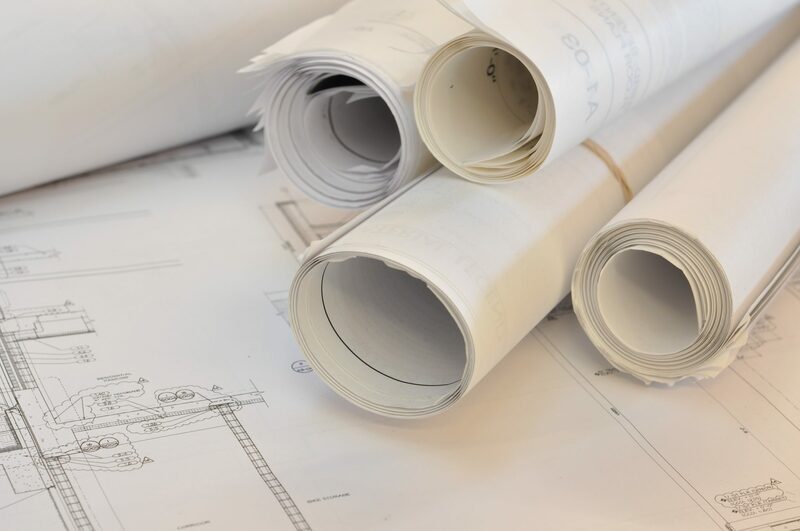 Planning only for Assisted Living and Memory Care programs, we’re finding that 90-125 units provide the ideal balance of leasable area and a facility’s operational and financial requirements. The majority of those units will be designed for Assisted Living. When Independent Living residences are involved, our clients are eyeing unit counts in line with many of today’s market-rate multifamily projects – typically 200-350 units. Of those, half or more will be dedicated to Independent Living with the remainder split between Assisted Living and Memory Care residences. In our portfolio, Assisted Living residential facilities are experiencing the greatest evolution. With average resident entry age in the mid 80’s, and average stays less than two years, Assisted Living operators are aggressively rebranding themselves and their facilities. They seek to attract younger seniors, demonstrating healthier outcomes through an environment that promotes more active, fulfilling, and longer lives, where robust use of technology is seamlessly integrated into the daily life of everyone in the facility. Importantly, that same effort is key in attracting, developing and retaining staff—a factor often as important in site selection as cost and zoning approval to the success of a new development. 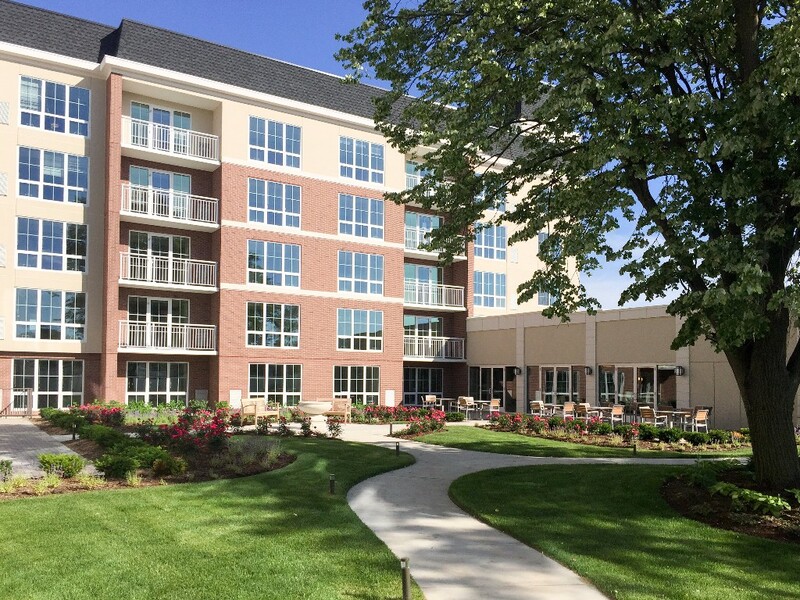 The courtyard and cafe patio at The Grand at Twin Lakes, an Independent Living community that FitzGerald adapted from an existing hotel in Palatine, Illinois. 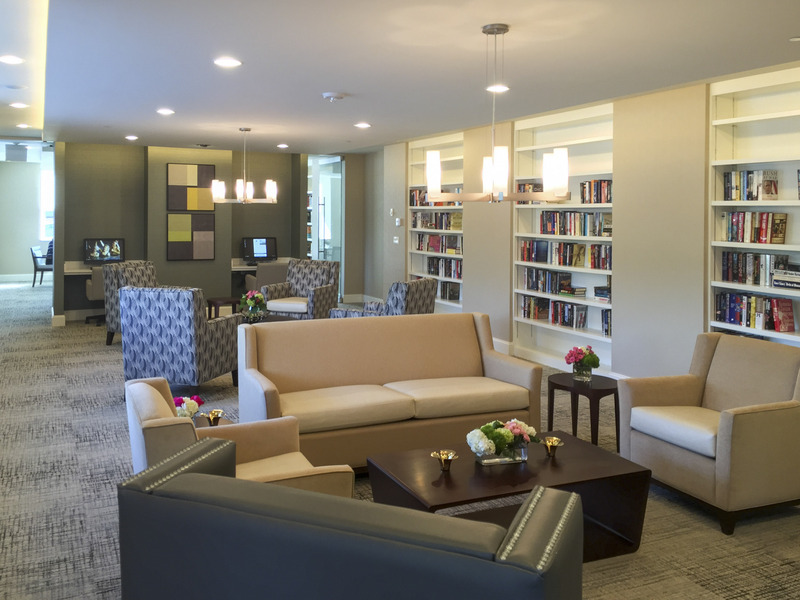 The design aesthetic of Assisted Living is also evolving. As developers and operators explore how best to blend the hospitality focused design of independent living with a strong health, medical and social services environment, they are looking for an architecture and interiors approach that celebrates and encourages activity, socialization and well-being. It is an exciting to be a part of that exploration, to work to discover enlightened planning and design strategies, to go beyond the predictable country club or hospitality aesthetic, and create an approach to Assisted Living and all senior housing that brings energy, joy and beauty into the lives of all who occupy the buildings. We’re especially excited about the prospect of helping to create more urban senior housing that can benefit from all the cultural and transportation resources the city has to offer. This is a space to keep our eye on, to be sure. What are you seeing happen in senior housing? Reach out to me at mbreclaw@fitzgeraldassociates.net to discuss how FitzGerald can support your next development.